Artist’s Proof is pleased to announce the exhibition Memory and The Subconscious: An Exhibition of works by Serbian artist Nenad Zaric. Please join us for the opening reception on Friday, December 7th, 2018 from 5:00-8:00 PM. A curated selection of his paintings will be on view at Artist’s Proof through January 22, 2019. Nenad Zaric's (b. 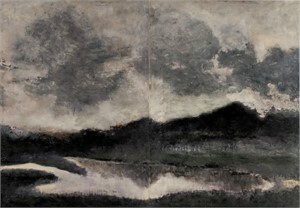 1986, Valjevo, Serbia) large-scale paintings reflect a personal, broody rumination on the Balkan’s tortured past both in regards trauma endured by the people and the physical alteration of the landscape. Zaric became aware of himself politically in the aftermath of the breakup of Yugoslavia, a period of political crisis in the 1980s which caused bitter inter-ethnic Yugoslavic wars which continued into the early 1990s. As a way to process the death and destruction he witnessed at such a young age, Zaric found solace through painting. Within his works, Nenad Zaric depicts a personal philosophy that dredges the confrontational history of his people without sacrificing hope for a brighter future. 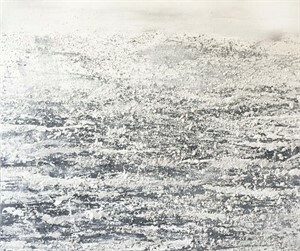 Inspired by nature's and its ability to regenerates itself even after periods of war, destruction, and human intervention, Zaric has shifted to creating work that represents a more profound sense of reality conjuring notions of both figurative and abstract qualities, revealing a deep emotional representation of the past. It is the artist's respect and admiration for the power of nature, that is personified throughout this new series. Inspired by both visual memory and the artist's subconscious, the landscapes are meant to be universal drawing inspiration from the four essential elements; Air, Water, Fire, and Earth. Zaric is not just reflecting on the destruction that he has personally witnessed but that too of the Thessaloniki front during WWI, which his family is connected to by that of his Great-Great Grandfather who gave his life in the conflict. Zaric sites the great psychologist Carl Gustav Jung's theory, that "many things come from a collective and familial unconscious.” His paintings are not only a reflection of his memory but that of his family, and his ancestors before him. 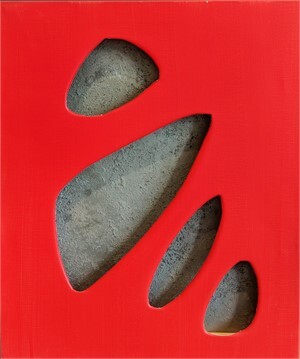 Reminiscent of barren or deserted terrain, Untitled II, incorporates sand, earth, and found objects to animate Zaric's acrylic forms with texture. Scarred grassland textures in the foreground, collocate with the fissures, and gashes carved from the landscape provide visual cues to the wounds from artillery barrages launched a century ago. Colors overlap and swirl, yet are given a sense of motion, continually rolling over one another. ”When I was a child, I witnessed bombs falling and the destruction that followed," Nenad reflects, "Despite this trauma endured, nature would ultimately regenerate itself. Consuming the remains of war.” There are scratches on the canvas as well as incoherent dashes of blank canvas, reminders of the gravity of the painting through the physical force such short and sharp marks would require. They are also indicative of Zaric’s restraint. He is unwilling to let these small marks of anger consume his entire work. While creating, Zaric prefers to leave the works untitled. By giving a name to the painting, the artist provides some information or an explanation of something. It is the artist intention that the observers come to the meanings alone and understands the painting in their way. Zaric alludes to the topography of the terrain forever altered by war and continues to explore the boundaries of art and its relation to his subconscious. By adding these natural elements to the paintings, Zaric renders dimensions and depth. Zaric explains, "this new series is devoted to nature, who suffers from our stupidity and which continues to give us life.” His works cover a vast scope of the human consciousness, creating both a memorial to the past and a message of hope for the future. Zaric graduated from the Faculty of Fine Arts in Belgrade with a specialty in painting. To date, he has participated in several group exhibitions and in 2014 held his first solo exhibition in Zvono Gallery in Belgrade. 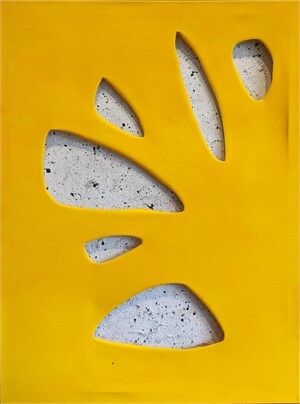 Artist’s Proof featured his debut Solo Exhibition in the United States in 2015. For more details, please contact Mackenzie Spriggs at mackenzie@aproof.net or 202. 803.2782. Artist’s Proof is pleased to announce the exhibition Memory and The Subconscious: An Exhibition of works by Serbian artist Nenad Zaric. Please join us for the opening reception on Friday, December 7th, 2018 from 5:00-8:00 PM. A curated selection of his paintings will be on view at Artist’s Proof through January 22, 2019. Nenad Zaric's (b. 1986, Valjevo, Serbia) large-scale paintings reflect a personal, broody rumination on the Balkan’s tortured past both in regards trauma endured by the people and the physical alteration of the landscape. Zaric became aware of himself politically in the aftermath of the breakup of Yugoslavia, a period of political crisis in the 1980s which caused bitter inter-ethnic Yugoslavic wars which continued into the early 1990s. As a way to process the death and destruction he witnessed at such a young age, Zaric found solace through painting. Within his works, Nenad Zaric depicts a personal philosophy that dredges the confrontational history of his people without sacrificing hope for a brighter future. 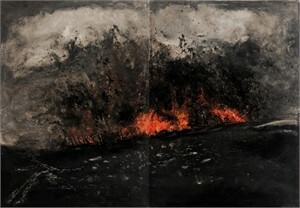 Inspired by nature's and its ability to regenerates itself even after periods of war, destruction, and human intervention, Zaric has shifted to creating work that represents a more profound sense of reality conjuring notions of both figurative and abstract qualities, revealing a deep emotional representation of the past. It is the artist's respect and admiration for the power of nature, that is personified throughout this new series. Inspired by both visual memory and the artist's subconscious, the landscapes are meant to be universal drawing inspiration from the four essential elements; Air, Water, Fire, and Earth. Zaric is not just reflecting on the destruction that he has personally witnessed but that too of the Thessaloniki front during WWI, which his family is connected to by that of his Great-Great Grandfather who gave his life in the conflict. Zaric sites the great psychologist Carl Gustav Jung's theory, that "many things come from a collective and familial unconscious.” His paintings are not only a reflection of his memory but that of his family, and his ancestors before him. 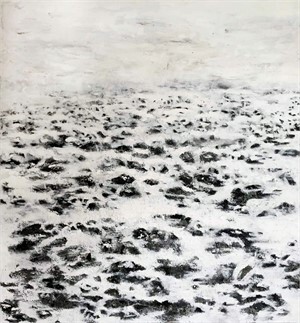 Reminiscent of barren or deserted terrain, Untitled II, incorporates sand, earth, and found objects to animate Zaric's acrylic forms with texture. Scarred grassland textures in the foreground, collocate with the fissures, and gashes carved from the landscape provide visual cues to the wounds from artillery barrages launched a century ago. Colors overlap and swirl, yet are given a sense of motion, continually rolling over one another. ”When I was a child, I witnessed bombs falling and the destruction that followed," Nenad reflects, "Despite this trauma endured, nature would ultimately regenerate itself. Consuming the remains of war.” There are scratches on the canvas as well as incoherent dashes of blank canvas, reminders of the gravity of the painting through the physical force such short and sharp marks would require. They are also indicative of Zaric’s restraint. He is unwilling to let these small marks of anger consume his entire work. While creating, Zaric prefers to leave the works untitled. By giving a name to the painting, the artist provides some information or an explanation of something. It is the artist intention that the observers come to the meanings alone and understands the painting in their way. Zaric alludes to the topography of the terrain forever altered by war and continues to explore the boundaries of art and its relation to his subconscious. By adding these natural elements to the paintings, Zaric renders dimensions and depth. Zaric explains, "this new series is devoted to nature, who suffers from our stupidity and which continues to give us life.” His works cover a vast scope of the human consciousness, creating both a memorial to the past and a message of hope for the future. Zaric graduated from the Faculty of Fine Arts in Belgrade with a specialty in painting. 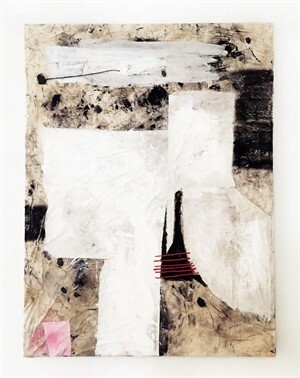 To date, he has participated in several group exhibitions and in 2014 held his first solo exhibition in Zvono Gallery in Belgrade. 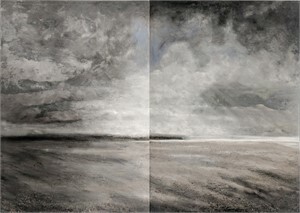 Artist’s Proof featured his debut Solo Exhibition in the United States in 2015. Washington Post Press Mention of Exhibition For more details, please contact Mackenzie Spriggs at mackenzie@aproof.net or 202. 803.2782.